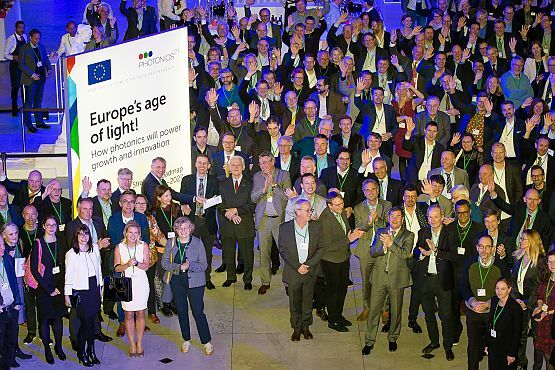 in this newsletter we like to provide you some impressions of the last Photonics PPP Annual Meeting which took place on 27th and 28th March 2019 in Brussels. 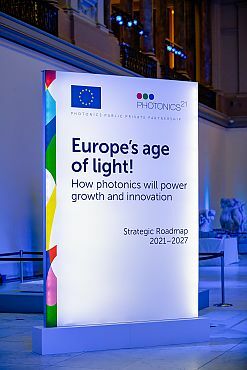 During the event the new photonics roadmap was officially published and handed over to the European Commission. We also like to inform you on the first joint EUREKA - Photonics21 Mirror Group call which has recently been launched and which addresses photonics for advanced manufacturing. In addition to this the European Commission has launched the Horizon Europe Impact Award, the deadline for applications is 28th May 2019. As always you will find some interesting event announcements within the next weeks and months. In preparation of the new EU framework programme Horizon Europe the new European photonics roadmap "Europe's age of light! How photonics will power growth and innovation" was presented and handed over to Carl Buhr, Deputy Head of Cabinet of Commissioner Gabriel, European Commission by the members of the Photonics21 Executive Board. The official ceremony and publication took place alongside the symposium of the Photonics Public Private Partnership Annual Meeting 2019 in the Royal Museum of Fine Arts in Brussels. The photonics roadmap outlines the future research and innovation challenges for the next seven years. The electronic version is available for download. Austria, France, Germany, Israel, Poland, Switzerland and the United Kingdom have launched the joint call for proposals Photonics for advanced manufacturing, which intends to fund joint research and development in the area of photonics. Applicants are expected to undertake research aiming at marketable products, services or technologies with high market potential in the participating countries and/or Europe. This call will be administered under the regulations of the intergovernmental EUREKA network. Interested parties are invited to submit R&D&I project proposals addressing photonics for advanced manufacturing. Advanced (industrial) manufacturing is commonly defined as the use and/or integration of innovative technologies – here: photonics – in order to improve both products and processes. To look for potential project partners a matchmaking website for potential proposers has been set up. Another highlight is approaching. This year's Laser World of Photonics is taking place in the last week of June in Munich. The fair brings together the international photonics community, so don't let this opportunity pass and meet your peers in Munich. Stop by at the Photonics21 booth and get the latest information on Horizon Europe. The European Commission has launched the first Horizon Impact Award. This prize acknowledges and rewards the most influential and impactful projects under Horizon 2020 or FP7 which have created a societal impact and will celebrate the best outcomes and the people who made them happen. The contest is now open to all participants who completed an FP7 or H2020 project. Each of the five winners will receive €10 000 at the award ceremony during the European Research and Innovation days in Brussels in September. You can apply through the Funding and Tenders portal. The deadline for submission is 28th May 2019. For more information about the eligibility and award criteria, please visit the European Commission website. The 5th edition of Tech Tour's European Photonics Venture Forum will take place on 26-27th of June, organized in the framework of the Laser World of Photonics in collaboration with ActPhast, Photonics21 and EPIC. Check a video from the last edition of Photonics Venture Forum! 30 companies will be selected from all applications received by a Selection Committee formed by industry experts. During the Venture Forum selected start-ups in the photonics domain will have the opportunity to pitch in front of international investors and Venture Capitalists. In addition, will profit from a special mentorship course and will be able to set One To One meetings with all participants of the forum. 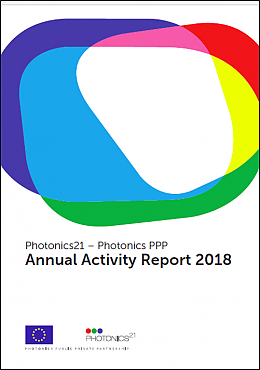 The Photonics21 - Photonics PPP Annual Activity Report 2018 has now been published alongside the Photonics PPP Annual Meeting 2019. It outlines the activities of the platform as well as the performance of the Photonics PPP and the feedback on the Photonics PPP calls throughout last year. For any further details you can download the report in the download section of the Photonics21 website. The workshop will take place in Turin on 3rd June 2019 during the national conference Automotive 2019. The aim of the workshop is to discuss about the solutions that photonic technologies open up for the innovation of the automotive sector with relevant industrial players and PMEs, clusters and hubs, venture capitalists, and higher education center representatives. In the framework of the Spanish Meeting of Optoelectronics (OPTOEL2019, Zaragoza), Fotónica21 organizes the "Photonics 4 Optical Fiber Applications" Workshop that will take place next 3rd July 2019, from 4.00 to 6.30pm. The Workshop is dedicated to Optical Fiber for communications and sensing applications, and will count on relevant speakers, with representatives of the Administration, industry and academic sector.